Anne Duncan poses for a photo at the exhibit. The Center for Visual Arts and the Office of Study Abroad of the Johns Hopkins University (JHU) is hosting an exhibition of photos taken by students, a six credit course, to Ireland earlier this year. The photos can be viewed in the Jones Building, Mattin Center, on the campus of JHU. It is located at 3400 N. Charles St., 21218. County Clare in the Wild West of Ireland was the location for the photography study by the students. It is bordered on the west by the Atlantic Ocean. Clare is part of the ancient Irish province of Connacht. Like other western counties in this mix, it it very rural and has a number of the population that still speak the Irish language. I had an opportunity Friday to view the riveting photos from the study abroad and also chat with one of the participants, Anne Duncan. I found her photos, along with those of the other students, to be stunning. A native of Brooklyn, New York, she told me: “It was a Hopkins program to Ireland. We were in County Clare for a month. We stayed in the town of Ballyvaughan, which is know for its Irish music and festivals. “The Burren College of Art which was our base was in a refurbished old castle,” Duncan added. 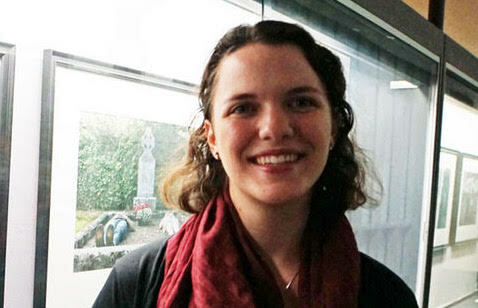 The instructor for the Study Abroad Class in Ireland was Phyllis Berger. She is the “Photography Supervisor in the Center for Visual Arts.” Mrs. Berger is also well known in the Baltimore community for her photography skills. If you get a chance, don’t miss this exhibition by the JHU students. It also includes a delightful slide show. You will think you are back in old Ireland for sure. To check out more of my photos, go to my Facebook page.